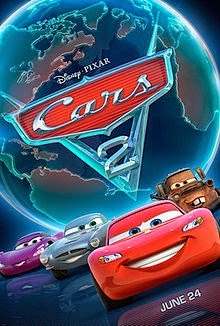 denise Leora madre: Review: The Mater Problem in "Cars 2"
A wife, mom, writer, and perfectionist chasing her dreams. Pray for me. Review: The Mater Problem in "Cars 2"
Disney/Pixar’s Cars 2 is an internationally-themed sequel starring Mater, the kindhearted, southern-accented best friend. Though not generally anti-sequel, I barely liked this film (and I'm not alone). My issues lies with a central theme best expressed in this conversation between main character Lightning McQueen and Uncle Topolino halfway through the movie. McQueen: I brought my friend Mater along on the trip. And, you know, I told him he needed to act different, that we weren’t in Radiator Springs. Uncle T: This Mater…is a close friend? McQueen: He’s my best friend. Uncle T: Then why would you ask him to be someone else? Uh, slow your roll, Uncle T.
Don’t get me wrong. I liked Mater in Cars. He was supportive, optimistic, and exactly the kind of friend McQueen needed. But in Cars 2, most of his behavior toward his so-called best friend was anything but friendly. The first scene between McQueen and Mater occurs when McQueen returns to Radiator Springs at the end of the racing season. Fresh off another Piston Cup win, McQueen spends the entire afternoon with Mater. Overjoyed to have his best friend back, Mater discusses his plans for their evening. But McQueen delicately declines, wanting some alone time with girlfriend Sally. What does the crestfallen Mater do? Unable to be away from McQueen for one night, he poses as a waiter at the restaurant where McQueen and Sally are dining. This decision ignites a sequence of events resulting in McQueen entering the World Grand Prix instead of spending the summer relaxing with Mater, Sally, and the rest of his crew. McQueen apologies for returning to work so soon, but Sally says it’s no big deal. Those eyes are a combination of fear and "Woman, are you crazy?" Yet McQueen considers her words, as he watches Mater sip some other car’s drink then spit the unwanted beverage back into the straw. Maybe he feels guilty for leaving Sally and wants to make nice. Maybe he hopes against hope Mater will not be and do what he already knows Mater will be and do. Whatever his reasons, McQueen should stay in first gear and leave his best buddy behind. Let's fast-forward to the scene that really burns my rubber: The welcome reception for the World Grand Prix. Mater’s definition of help is introducing McQueen to Francesco Bernoulli, McQueen’s rival, and asking for a photo with him, adding that Sally is a huuuuuge Francesco fan, to McQueen's dismay. Mater then heads off in search of free refreshments. This scene irks me so deeply I want to hurl a fiery brick through Mater’s windshield. Or at least flatten his tires. He is loud, obnoxious, and completely ignores McQueen’s attempts to corral him. 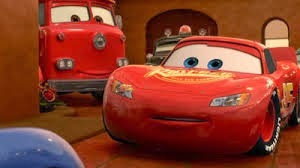 His behavior embarrasses McQueen on an international, professional stage and directly results in McQueen losing the first race of the World Grand Prix. Still want Mater to remain the same, Uncle T? McQueen doesn’t ask Mater to be a different person. He asks him to act like he has the sense Goodyear gave a tire, which his “best buddy” should be more than willing to do. And do so without being asked. In fairness, knowing Mater has seldom been outside of Radiator Springs, McQueen should be a better guide, prepare him and set expectations. He could start with a plane-ride primer on professional etiquette, appropriate pit crew behavior, and what to do with wasabi. Ultimately the plot hinges on Mater’s presence at the World Grand Prix—intrigue and identity-issues abounding—so McQueen must bring him along. But for our well-intended favorite race car, it seems inviting Mater causes nothing but car trouble. Get alerts for new posts! Weird Al Indicts Us for "Word Crimes"
All writing content is the exclusive, original property of denise Leora madre. Watermark theme. Theme images by Ollustrator. Powered by Blogger.